I doodled Annabel Acorn while on holiday and have been so looking forward to adding some colour when a suitable project came up. This week Shelly has set the project over at Crafty creations and it seemsed very appropriate as my DT card. I have coloured the image using copics, Basic grey DP, Papermania Christmas ribbons, brads and a wild child Basic Grey rubons. Added some extra oak leaves cut from second image. 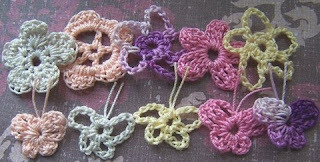 this weeks prize are these beautiful crochet flowers and butterflies from Paperblooms. Pop over and see all the lovely DT cards and join us with your crafty creation! She is a beautiful image, had an angelic feel to her. now THAT'S one gorgeous acorn! What gorgeous colours and image Claire! Fab! Fabulous new image Claire!! Lovely card! What a great image!!! I love this card!! This is a gorgeous card! and what a great image with lovely colours. Great card Claire, I love your image! Your card is adorable, Claire and so is Annabel Acorn! Oooooh I love this Claire, gorgeous image and colours, perfect for Autumn!